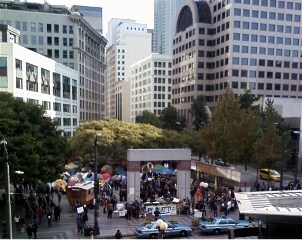 Our local chapter of OWS is called Occupy Seattle. Let me offer a few general observations based on six days, participating as I did personally for a total of nearly 30 hours. I’ve been on two marches, one with c. 1000 people and another with more than 3000 on October 15. And I’ve been able to interview many people at the rally and campout location in Westlake Center, at the heart of downtown. In fact I helped a little in setting up one of the forbidden tents later tore down by Seattle police. I am a veteran of the “revolution” of the 1960’s. On my southern California campus (SDSU) I chaired SMC, the Student Mobilization Committee against the Vietnam War. One of the reasons I’ve enjoyed my time at Occupy Seattle is that it seems so familiar – like a time warp – bringing back as it does the impressions and feelings of my days of youthful activism. What’s missing in Seattle so far is the tear gas in my nostrils. But a massive police presence (including mounted patrols), the extraordinary sense of community with total strangers, the impassioned speeches, the beautiful and energetic young people, and the sound once again of that clarion call, “power to the people,” all resonate in the recesses of my memory. It has been invigorating and exhilarating for a culturally conservative 68 year old man. Because I recall the 1960s so vividly, therefore, the impression that troubles me most is related to the Scripture (Psalm 127:1): “Unless the Lord build the house, they labor in vain who build it.” In the 1960s we tried to make a revolution with little reference to God, and our sole positive achievement was in ending a dreadful war. In other ways we did a lot of harm, warping a Judeo-Christian American culture into a hedonistic and extensively paganized society. Mea Maxima Culpa. Today’s OWS movement is perhaps even more secularized – at least in Seattle – than what I witnessed in the 1960’s; and the war of the 1% against the 99% is going to be a lot harder to halt than was the war in Southeast Asia. It will be comparable perhaps to the challenges confronted in the Battle of Seattle (December, 1999) which did discommode the World Trade Organization conclave in our city and spawn other protests around the world. But none of the protests imposed more than a brief check to a global free-trade economy with disproportionate profits for multinational corporations. There is indeed plenty of cause for outrage. But as Dr. Paul Kengor observes, OWS exhibits “nary a whiff of religious motivation.” Without the Cardinal virtue of prudence, accentuated by divine inspiration and wisdom, the movement is going to be all sail and no anchor. It could well end up on the shoals. Worse it could conceivably take the whole country onto the reefs. Notwithstanding the charming prospect of idealistic young people working and sacrificing for a greater cause, the fallen nature of man in his natural state is sure to do this movement in. OWS is doomed in my view, unless room is found for the leavening and redeeming influence of the Gospel. Washington State has long been the least churched state in the Union, and I was not surprised by the all-secularized nature of rallies, or by the dearth of prayer in the general assemblies at Westlake Center. I am encouraged, however, to read that in Occupy Boston a group called The Protest Chaplains has formed, consisting mainly of evangelical and Episcopal Protestants. At last word it was spreading to other cities including New York. In Occupy Seattle I’m gratified, at least, to encounter little if any hostility for wearing my “40 Days for Life Hat,” or for identifying myself as writing an article about OS for Catholic Lane. The younger people I’ve interviewed here do not strike me as anti-Christian, nor as anti-Catholic, but as products of the all-secularized public school system which teaches them to see religion as strangely out of place in the public square. To counteract this spiritual pall over OWS, we need an impassioned and numerically significant Christian presence. As a Catholic I’ve felt like the Lone Ranger – until last Saturday when three fellow practicing Catholics marched with me. I’ve posted on Facebook to encourage social conservatives to join in, and to exercise a salutary influence on OWS. But I’ve seen and read nothing of any discernible convergence of forces. Maria, a quasi-leader in Seattle (OS denies that it has leadership other than the general assembly) told me that no overtures whatsoever have come from the Tea Party. The two uprisings aren’t even communicating. I read recently that Tea Party leaders bristle at any suggestion of similarities between these dual insurgencies. Part of the problem might be in divergent political approaches. The Tea Party has morphed into an appendage of the Republican Party, whereas OWS continues at this point to eschew party politics. Another obstacle to cooperation might be the cultural divide. At OS rallies the F-word is frequently heard, and is even repeated nonchalantly by the whole general assembly’s via the “people’s microphone.” I doubt that any speaker at a Tea Party rally would dare use such a vulgarism. The contrast in dress is equally stark between the two movements, although the largest crowd I saw at OS did include proportionally more well-groomed and decently-attired participants. But the main difference was the Christian invocations that preceded Tea Party rallies; whereas formally calling to mind the presence of God has, to my knowledge, never happened at Occupy Seattle. An open mike session before a large crowd in Seattle one Saturday did see a Buddhist speaker offer a prayer, and a Zoroastrian rose to recite a spiritual chant. However, another speaker took the stage and read a poem about “enforced divinity” as a form of tyranny. More than one person at OS has described this as a “spiritual revolution.” Some, like Pushcara in her Gypsy wagon, claim it is part of a “world wide spiritual awakening.” But as St. John the Apostle admonishes us, “do not believe every spirit, but test the spirits to see whether they are of God” (1 John 4:1). At formal meetings, reverence for the God of the Bible is scarcely acknowledged, although love of neighbor is abundantly on display in terms of building community with fellow OS protestors. But the vertical half of the Great Commandment is conspicuous by its absence. Such a fundamental flaw is, in my view, worthy of a protest in itself. The all-secularized nature of this movement stands in contrast to revolutions which proved successful in my lifetime. The Arab Spring of 2011 comes flaming to mind, where religion has been omnipresent – not the Christian religion to be sure, but Islam, the majority religion of the Middle East. The revolutions of 1989 in Eastern Europe began in Poland, where Solidarity head, Lech Walesa, was openly and unapologetically Roman Catholic, and where an active role by Pope John-Paul II proved decisive. The overthrow of Communism in East Germany began a few months later with Protestant church meetings. In 1986 the People Power Revolution which overthrew the Philippine dictator Marcos, featured candy and rosaries handed out to government troops. Cardinal Jamie Sin played a leading role in the revolution. From 1974–1999 the Revolution in East Timor for independence from Indonesia was sustained, and ultimately successful – despite a prolonged government crackdown of great severity. The victory of the revolutionaries was largely due to inspiration from the Catholic religion and its clergy, including the Bishop and Nobel laureate, Carlos Filipe Ximenes Belo. I was born long ago during the Presidency of Franklin D. Roosevelt. FDR was, in my view, a political leader far greater than any politician we have seen in the 21st century. His great achievement was leading us to victory in a military effort that was manifestly not all-secularized. Let me share FDR’s stirring prayer which he offered (hear audio) for the success of the D-Day invasion. …..Almighty God: our sons, pride of our Nation, this day have set upon a mighty endeavor, a struggle to preserve our Republic, our religion, and our civilization, and to set free a suffering humanity. …..Lead them straight and true; give strength to their arms, stoutness to their hearts, steadfastness in their faith. …..They will need Thy blessings. Their road will be long and hard. For the enemy is strong. … Some will never return. Embrace these, Father, and receive them, thy heroic servants, into Thy kingdom. …..And for us at home … help us, Almighty God, to rededicate ourselves in renewed faith in Thee in this hour of great sacrifice…. As we rise to each new day, and again when each day is spent, let words of prayer be on our lips, invoking Thy help to our efforts. Today’s nascent revolution (if such OWS grows to be) stands in stark contrast to FDR and “America’s greatest generation” in that God is pretty much ignored. Fellow Christians: instead of sitting on the sidelines and badmouthing the idealism and determination on display, how about if we enter into the process, introduce our Christian worldview, and solicit the interposition of Divine Providence? The Protest Chaplains are a start, but where are the Catholics? I presume to say that, given an explicitly and pervasively Christian presence, God might be more inclined to bless the movement. Imbued with the spirit of our nation’s Judeo-Christian heritage, OWS could help effect insurrectionist solutions to postmodern maladies.